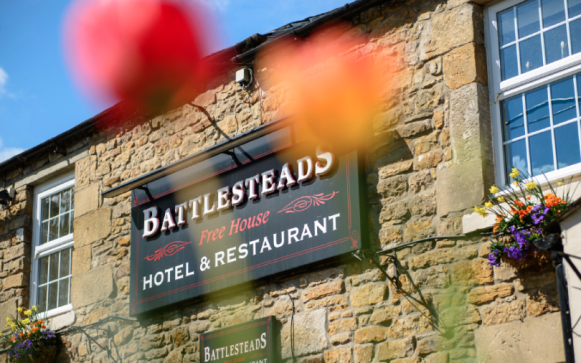 Battlesteads is a free house pub, hotel and a restaurant all rolled into one, located in the peaceful, pretty, properly rural Northumberland village of Wark not far from Hadrian's Wall (hence the name). The owners are passionate about good beer and pride themselves on serving locally sourced and home-grown produce. It adds up to a lovely, out-of-the-way place to stay. Eat: Food is a big focus for the pub. Given its location in the heart of Northumberland, it is surrounded by some of the finest livestock, game, fish, and poultry in the country, so prime local ingredients feature large on the menu. In the summer they grow many of their own herbs, salads and vegetables, with lots of fruit from their kitchen garden in the autumn too. Head Chef Eddie Shilton's cooking is modern British, with a few international choices. So expect Northumbrian fillet steaks and local rabbit pie at the same time as confit of duck leg and beef bourguignon. Don’t miss the award-winning bread and butter pudding. It is delicious. Sleep: This is a properly dog-friendly venue and dog owners can stay in any of the ground floor rooms. There is a charge of £10 per night per pet and you have to bring your own bedding, but a warm canine welcome awaits in the shape of Winston the resident Labrador. All the rooms are comfortable, stylish and a little funky, with lime green, deep turquoise and sugar pink colour pops, as well as nice extras such as homemade biscuits (for the humans) and fresh fruit baskets. The ground floor double is particularly appropriate for dog owners, featuring dog-themed wallpaper, while the family room has heaps of space if your dog is on the larger side. Walk: The village is located on the edge of the outstanding Northumberland National Park and there are five recommended walks in the area, with details printed in handily waterproofed booklets available in the pub. These include the 4.5 mile Wark Bridge walk which starts as a pretty riverside stroll then winds uphill through farmland and along a lovely country road overlooking the North Tyne Valley. Or you could do the 4.75 mile walk to Sheilahaugh and Conshield which takes in some wild Northumberland landscapes. There is also Hadrian’s Wall itself which has a public path running along it so is completely dog-friendly.